Our modern, electric eyeletting machines and punching tools have been designed for fast, efficient assembly of Bodill Parker eyelets and rings – for the highest quality finish, whatever you manufacture. 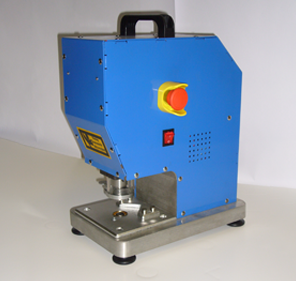 The low cost of our electric eyelet assembly machines makes them ideal for medium to high volume quantities of eyelets. Bodill Parker are manufacturers and suppliers of affordable, high quality eyelet tools and presses for all sizes of eyelets and rings, and for all applications. Unsure what eyeletting equipment you need? Don’t worry – call us on 0121 557 4164 and our friendly team will talk you through your options, and can even demonstrate our easy-to-use eyelet machines at your premises. What’s more, we’re so confident that once you’ve tried our equipment, you won’t want to return it! Talk to us about a free equipment trial today.